The marathon pitching exploits of Japan's high school baseball players may soon be a thing of the past. Japan's High School Baseball Federation is considering introducing measures such as a tiebreaker and pitch counts limits in order to protect the health of the country's future stars. New York Yankees right-hander Masahiro Tanaka, who was recently placed on the 15-day disabled list with a partially torn ulnar collateral ligament in his right elbow, was a standout in Japanese high school baseball. He led his high school team to a championship in 2005. New York Mets pitcher Daisuke Matsuzaka, who had elbow surgery in 2011, gained notoriety for throwing 250 pitches in 17 innings at the summer high school tournament in 1988 after a 148-pitch complete-game shutout the previous day. 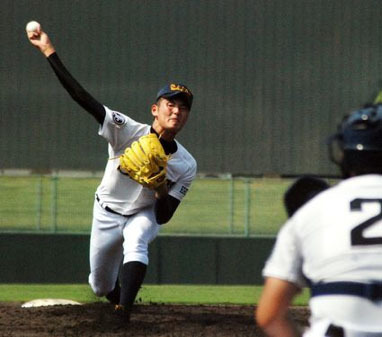 Tomohiro Anraku, who many consider the future of Japanese baseball, took the mound on July 16 and pitched a complete-game shutout an 8-0 win in a qualifying tournament for the summer tournament. The 17-year-old Anraku, who experienced pain in his right elbow last year, is no stranger to the type of marathon pitching performances that are legendary in Japanese high school baseball. In 2013, Anraku threw 183 pitches in one game at the Koshien high school baseball tournament after a 137-pitch outing the previous day. "High school coaches in Japan will argue if the core mechanics are good then a pitcher won't hurt his arm throwing every day," said author Robert Whiting, who has written several books on Japanese baseball. Whiting points out that Tanaka's former pitching coach with the Rakuten Eagles thinks the American obsession with pitch counts is a bad thing. Starting pitchers in Major League Baseball generally are limited to no more than 100 pitches per outing. One idea the high school baseball officials are pondering is a system similar to that used at the baseball tournament at the Beijing Olympics in which teams started with runners on first base and second base from the 11th inning on. The high school federation sent out a questionnaire to its 4,000 member schools in mid-July seeking feedback on the proposals. Many in Japan consider 250-pitch outings to be character building. Despite his injuries, Matsuzaka has said he feels more comfortable the more he throws. Even in professional baseball in Japan, pitchers throw on the sidelines in between innings to stay warm.